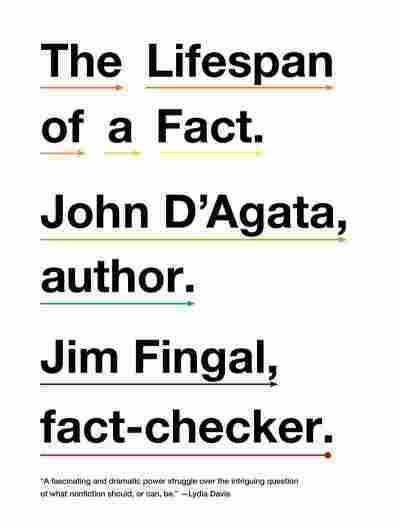 'Lifespan Of A Fact': Truth And Consequences The correspondence between John D'Agata and his former fact-checker Jim Fingal is antagonistic, hilarious and even profound. The Lifespan of a Fact might be the most improbably entertaining book ever published. At first glance, there doesn't appear to be much reason to think it will be enjoyable or, for that matter, tolerable: It's antagonistic, formally perverted and exhausting. But it's also hilarious and, sometimes, even profound. Co-authored by "lyric essayist" and University of Iowa professor John D'Agata and his former fact-checker Jim Fingal, The Lifespan of a Fact is the record of their combative correspondence. In 2003, Harper's commissioned an essay from D'Agata on the suicide of Levi Presley, a Las Vegas teenager who jumped to his death from the roof of a casino. But the piece was ultimately pulled after editors declared it irrevocably error-ridden. D'Agata then resold the essay to The Believer, where he met Fingal, who would become his fact-checker on the story — for the next seven years. The Lifespan of a Fact doesn't really even look like a book: The font alternates between black and red ink; the text is broken into irregular columns. For almost every proposed clause or sentence of John's ("It's estimated that only 40 percent of suicides are the result of chemical imbalance"), we get a caption from Jim ("No source for this, and I couldn't find anything that says this."). Often, John responds, spitefully, in turn. The first two pages of the book are devoted to the original essay's first sentence alone. There is more fighting than fact — and the confirmed facts aren't nearly as entertainingly contentious as the dubious ones. John maintains that he is an essayist, not a "writer of nonfiction," a categorical distinction that (he thinks) justifies his pliable definition of truth. Jim, theoretically accepting of John's self-description, asserts that he still has a job to do and insists, regardless of John's parsing of the difference between accuracy and precision, that there's such a thing as journalistic ethics. To which John, of course, responds that he's not a journalist. John and Jim both come off terribly — and then, briefly and only toward the end, very well. For most of the book, you want to bonk their heads together. John is ceaselessly self-aggrandizing: He talks of "needing" to use certain words, of the importance of "atmosphere." When Jim determines that a van mentioned in the essay is pink and not purple, John declares that the inaccuracy is intentional, that purple, with its two beats, sounds better than plain old pink. All of his reality is edited, and all of his truth tampered with in order to make Presley's death "seem more unique." It's hard not to wonder why he didn't just write a novel. Jim Fingal (left), now a software engineer, was the dauntless fact-checker for John D'Agata, author of the essay collection About a Mountain. John's endless renewing of his creative license exposes the absurdity of the very concept of fact-checking. Jim is forced into a reliance on suspect research material ("poorly constructed website about faeries") and the erudition of college buddies (in one dispute, he counters John's questionable use of a word with input from a Harvard grad student; John suggests a second opinion: "Maybe somebody at Yale knows. Or Dartmouth? Did you try Dartmouth?"). But just as you think you've picked sides, Jim begins to provide increasingly thorough — and increasingly maddening — detail. Soon, you come to resent his facts, not because they ruin felt truth — which is John's whole point — but because Jim seems unable to appreciate shades of interpretation. The epistolary jousting works. It points up the near-impossibility of imposing moral responsibility on a genre as ill-defined as nonfiction. After pages — years — of John and Jim's "intellectual anarchy," dogged quarreling, fruitless brokering and painstaking revisions, we're worn out and prone to side with whomever is being less infuriating. To indulge misgivings and imagine that the book itself is an artful manipulation of the truth of John and Jim's experience (it is suspiciously readable) would be to miss the point entirely. To do anything but take them at their word is a waste of time — not to mention a relinquishing of pleasure. They do such a good job of dismantling the myth of "fact" and "truth" that it's hard to care about what really happened during the editing of The Lifespan of a Fact. In the end, John's original essay — and his highfalutin theories about what he's trying to accomplish — comes across as the epitome of literary hubris. And Jim's loss of reverence for so-called reality — after he uncovers a discrepancy in the coroner's report that is largely the basis for John's piece — seems an apt casualty of the rhetorical contretemps. For all its absurdity, John and Jim's war of words is a sick thrill to read — even if the fact-challenged essayist and his persnickety, one-man truth squad never land a gig again.